Starting with the basics of camera control and moving on to shutter speeds, aperture, zoom and flash, Langford’s Starting Photography gives you the only introduction to digital photography you’ll ever need. Once you’ve mastered the basics, examples and projects allow you to explore the key methods for capturing a variety of subjects from portraits and pets to landscapes and sports photography, alongside straightforward advice on using editing software to get the best out of your digital shots, will have you producing unforgettable images in moments. 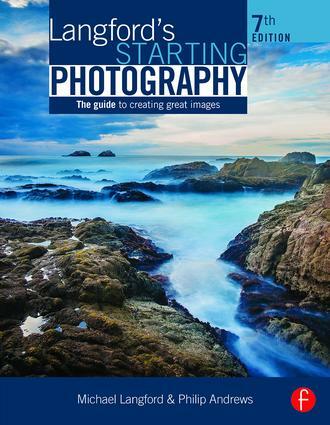 More inspiring than a textbook, more interesting than a reference, and more in-depth than a photography class, Langford’s Starting Photography is the only guide you need to start taking great images. Chapter 1: Picture Making; Chapter 2: Cameras, Sensors and Film; Chapter 3: Creative use of Camera Controls; Chapter 4: Tackling Different Photographic Subjects; Chapter 5: Controlling Light; Photographic Workflow; Chapter 6: Digital Processing and Printing; Chapter 7: Black and White Film Processing and Printing; Chapter 8: Experimental and constructed images; Chapter 9: Presenting and Assessing Your Work; Chapter 10: Troubleshooting; Appendices. Glossary. Philip Andrews is Adobe Australia's official Photoshop and Elements Ambassador. He is an experienced photographer, author, magazine editor, and online course creator. He was previously a lecturer at the Queensland School of Printing and Graphic Arts, Australia, and Nescot, England. He is a beta tester for Photoshop, an alpha tester for Photoshop Elements, and a Photoshop specialist demonstrator for Adobe Australia. Philip is also co-founder of photo-college.com, an online photography training college. He's a regular contributor to several magazines including Shutterbug, Amateur Photographer, Australian Photography, and Better Photography, and is senior contributing editor for Better Digital, columnist for What Digital Camera, and co-editor and publisher of Better Photoshop Techniques magazine.